SolarWinds Network Performance Monitor (NPM) - Symtrex Inc.
SolarWinds know that keeping up with all the new technologies and changes in your IT environment is a challenge. Today’s data center networks are moving beyond traditional LAN/WAN switching and routing to a true network fabric that incorporates physical devices, virtual networks and proprietary networking. Virtualized data center and private cloud initiatives are piling on top of the need to deliver 100% availability of a constantly changing network—and often with no additional resources to help. How can you possibly keep up? SolarWinds know the challenges you face, because their network engineers and system administrators just like you. They know what it takes to manage complex, evolving networks and data centers. 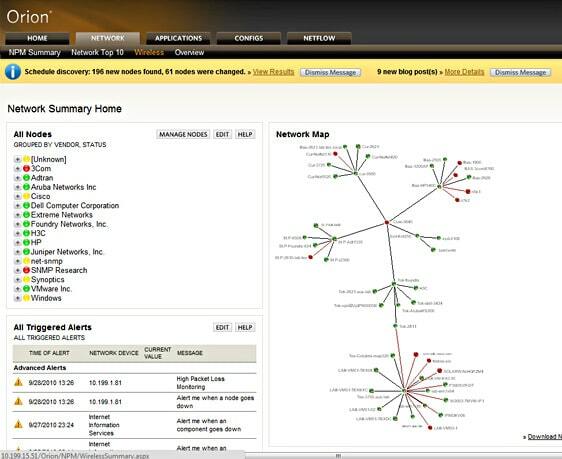 In fact, SolarWinds pooled all of their “what if’s” to design Orion Network Performance Monitor (NPM)— a powerful, yet easy-to-use, network availability and performance management solution that delivers the critical information you need to stay on top of your evolving network. Orion NPM enables you to quickly detect, diagnose, and resolve network performance problems and outages—before you start getting calls asking if the network is down. And Orion NPM is the easiest product of its kind to deploy, use, and maintain. That means you can spend your time actually managing your network, not supporting your network management software. Plus, with one-hour, do-it-yourself deployment, you’ll be monitoring immediately, instead of filling out statements of work for more consultants. See how easy network management can be with Orion NPM! Enables quick and easily troubleshooting of network issues with SolarWinds LUCID™ (Logical, Usable, Customizable, Interactive, Drill-down) Interface Enhanced in v10.1!